Ben Aitken's Narrowing The Field service is now in its fifth year of publication and it is one of just two National Hunt (jumps) racing services that I keenly follow. The reason? It flat out works! Ben, or Hairy Ben as I like to call him (private joke! ), will be a familiar name to those of you who have been following his excellent Badly Drawn Horse series this summer. In those posts, he identified horses that ran better than their finishing positions suggested when badly inconvenienced by their stall position, hence the name Badly Drawn Horse. That threw up some big priced subsequent winners like Field of Dream 14/1, York Glory 14/1, and Redvers 8/1. But Ben is much better known for his work through the winter with Narrowing The Field (NTF). 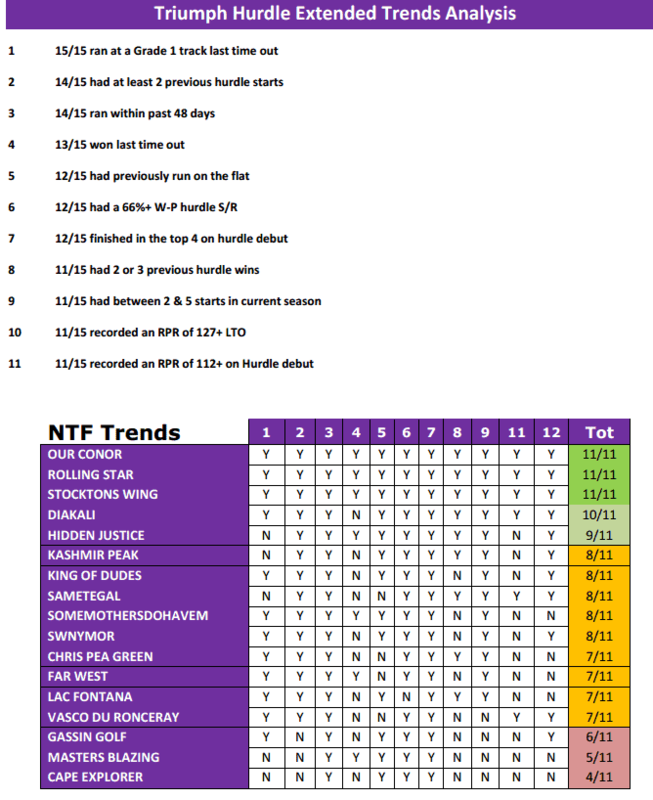 NTF has grown and evolved since its first iteration in 2008. Back then it was 'just' a dosage service, dosage being a method of reviewing a horse's pedigree to establish if it is likely to be well suited by the conditions of today's race. 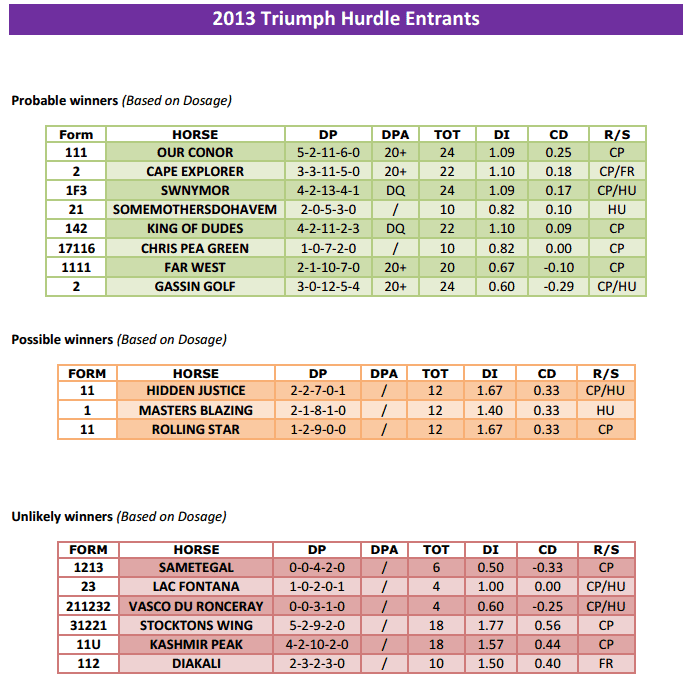 Zoom forward to 2013, and NTF still includes dosage profiling - to the best of my knowledge, the only place you can get this info for UK NH racing - but that's just the start of it. Ben will be covering around 140 of the top races in Britain and Ireland this jumps season, starting this weekend with the first Cheltenham meeting of the year. As well as the dosage analysis, each race also includes a look at the pace profile of the race (i.e. are there lots of pace makers? Or might it be run at a crawl?). This is really important in understanding whether the race will place an emphasis on finishing speed or stamina reserves. Then there's a full trends analysis covering up to a dozen of the strongest trends for each race, along with a scoring grid outlining how the runners fare against those trends. By now, the race is starting to take shape and we have a view of all of the runners and how they're likely to perform. But there's more depth yet. Next up is the detailed pace projection, which is a very powerful tool when you understand how to use it. That's a lot of information, so Ben makes it easy on us by providing a potted summary for those - like me sometimes! - who don't have either the time or the inclination to work through the atomic detail, by providing a single summary page. In the example above, Our Conor was a highly impressive 4/1 winner, and that was no surprise to NTF followers, some of whom went 'all in' on this clearly well suited horse. That's the level of depth and quality Ben brings to every one of the 140-odd races he's covering this season. Obviously, they won't all find winners - no service will - but there is plenty of method to bring punters out in front again. And if you prefer to make your own selections, well that's positively encouraged. The data is there and, for example, I very often ignore certain trends that I don't think are that important, and make my selections based on the revised criteria. 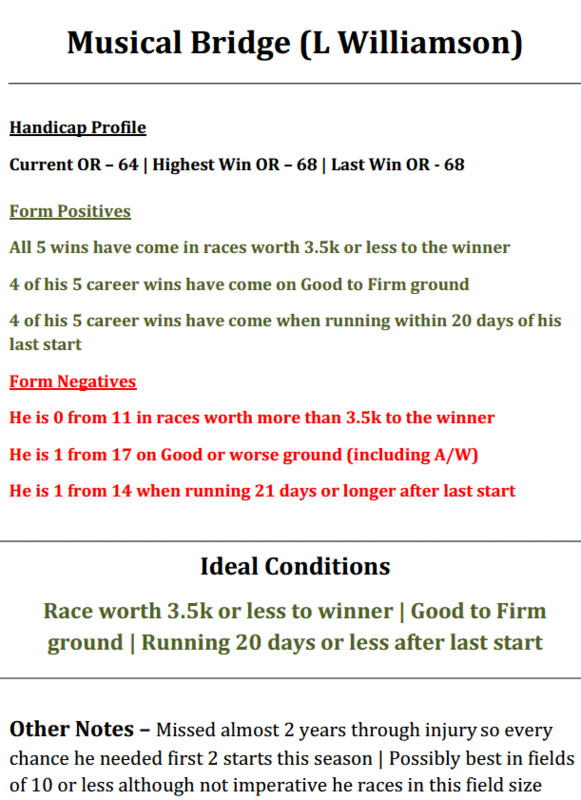 Narrowing The Field costs about £1 per race, which is excellent value given the legwork Ben puts in, and the results he gets out. 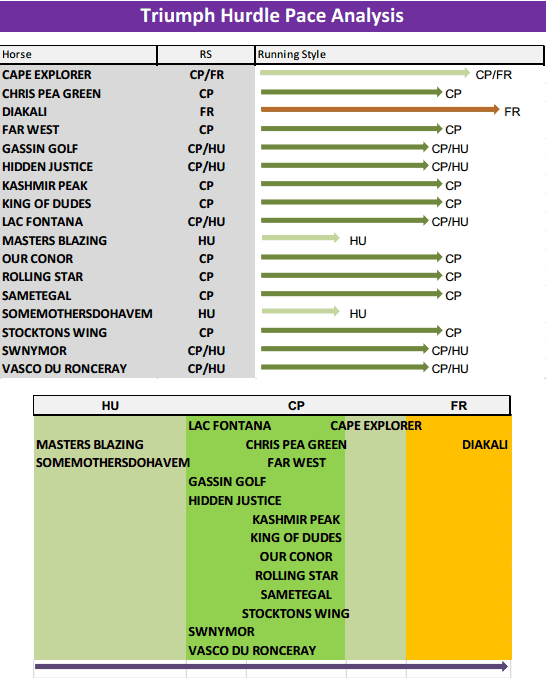 But the NTF service is about much more than 'just' these big race profiles. 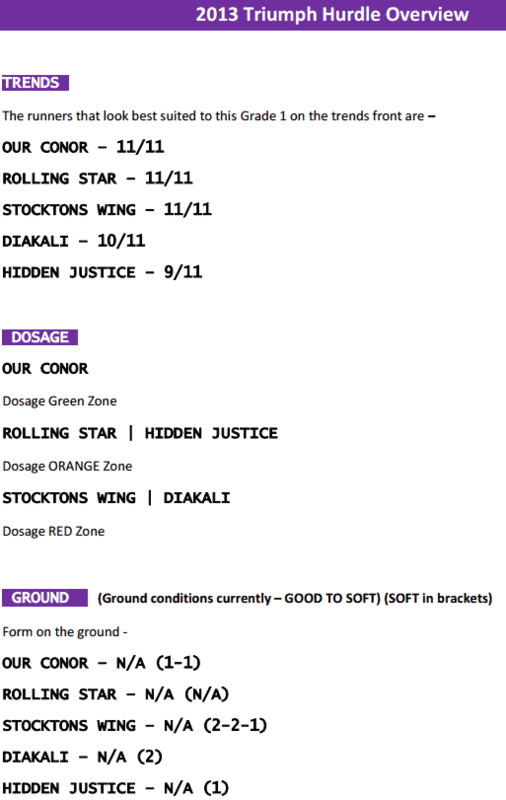 This is a top quality service for the whole National Hunt season (from this weekend until next May), and - as I say - it's one of just two 'stats' products I use myself during this time (the other is TrainerTrackStats). p.s. there are also some free reports that Ben has created, which can be downloaded here.